„Henri Cartier-Bresson – The Decisive Moment“ examines Cartier-Bresson’s influential publication, widely considered to be one of the most important photobooks of the twentieth century. Pioneering for its emphasis on the photograph itself as a unique narrative form, The Decisive Moment was described by Robert Capa as “a Bible for photographers.” Originally titled Images à la Sauvette (“images on the run”) in the French, the book was published in English with a new title, The Decisive Moment, which unintentionally imposed the motto which would define Cartier-Bresson’s work. This exhibition at the International Center of Photography, New York, details how the decisions made by the collaborators in this major project—including Cartier-Bresson, French art publisher Tériade, American publisher Simon & Schuster, and Henri Matisse, who designed the book’s cover—have shaped our understanding of Cartier-Bresson’s photographs. 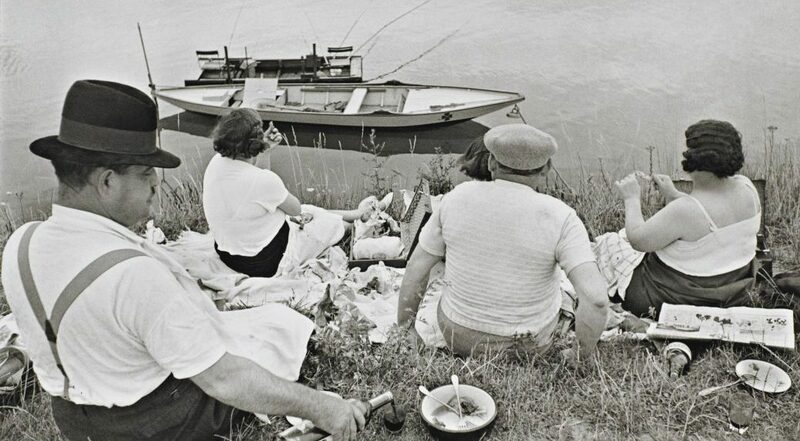 Cartier-Bresson was most interested in work that was simple and candid. With his rigorous approach he established himself as a pioneering photographer, artist and visionary thinker who saw photography outside galleries and beyond the daily papers. He had an early interest in the photo book as a public vehicle for his work and put a great effort into „The Decisive Moment“: it was filled with examples of that crucial moment, juxtaposed with delicate geometry and a deep sense of humanity. It was produced, start to finish, in just under six months in New York and France under the title Images à la Sauvette. The original edition was limited to about 10,000 copies at a time when books were still largely reserved for literature and classical arts. And it was indeed unconventional – with a cover by Henri Matisse, Cartier-Bresson’s personal introduction and richly textured photo gravure prints. Through vintage gelatin silver prints, first-edition publications, periodicals, and correspondence, Henri Cartier-Bresson: The Decisive Moment brings new insights to this iconic work.